Remnants Starting at $2.45 sqft. 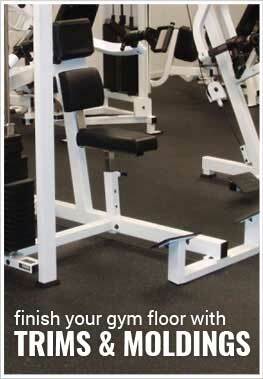 Description - Our PowerPlay rubber tiles are the perfect fit for your home gym needs. The durability of these rubber gym tiles is better than what you will find in most commercial gyms while being extremely easy to install. Our PowerPlay rubber tiles have such a precise interlocking system they give you a near invisible seamless appearance making your home gym floor look like one solid piece. These gym tiles come in 5 popular colors that ship quickly to get you up and running in your home gym. If your looking for the durability of a commercial gym but want the ease of installation and a great price these rubber tiles should be your first choice. Material - Our 3/8" PowerPlay sports floor tiles are only made from the highest quality recycled SBR rubber and EPDM virgin rubber color flecks. Recommended Uses - PowerPlay rubber tiles have been used successfully as home gym flooring, in commercial gym floors, kids play rooms, in dog care facilities, in locker rooms and dug outs, in school weight rooms, as ski lodge flooring, in ice skating facilities, over radiant heated floors, in basements, in outdoor storage sheds, and in a variety of other places where an anti slip flooring with shock absorbing properties are desired. Available in corner, border and center tiles. Can qualify you for LEED credits. I bought 3/8" PowerPlay Rubber Tiles and love them. But I was wondering how I should clean them for mopping. What kind of cleaner do you recommend using for mopping? Pinesol? Thanks. Our 3/8" PowerPlay Rubber Tiles can be cleaned with a mop. We recommend using a synthetic mop head. Cotton mop heads will leave fibers left behind. Do not mop these tiles with Pinesol. You will want to use our Floor Cleaner and Degreaser or a mild soap and water solution like Dawn and water. This will help to keep your floor looking new for years to come. Does the measurement 2'x 2' include the locking part of the tile? Or when you trim that off to start against a wall does that make the coverage less than 2' x 2'? The size of the 3/8" PowerPlay Rubber Tiles is 24.12" x 24.12" with the locking tabs included. The tiles when interlocked will cover 24" x 24". Have been looking around trying to find a viable alternative to traditional vinyl tile for an art/craft studio in my home. Needs to be sturdy and long lived. Also needs to hold up to wheeled office chair and stool. Is this floor suitable for such an application? Thanks for any help/recommendations you have offer! Our 3/8" PowerPlay Rubber Tiles are a perfect alternative to traditional vinyl in your art and crafts studio. These tiles are very durable and are able to withstand a rolling office chair or stool on them. Do these tiles have a bad odor? Our 3/8" PowerPlay Rubber Tiles do not have a bad odor to them. These tiles are made from high quality rubber and are cleaned thoroughly to ensure that any excess oils and grime are removed. These tiles are made from rubber, so there is a slight odor. The odor is similar to that of a new pair of shoes. Can I interlock these 3/8 PowerPlay tiles with the 3/4" soft rubber tiles? You can't interlock our 3/8" PowerPlay Rubber Tiles and our 3/4" Soft Rubber Tiles. They have two different locking systems, and also, the Soft Rubber Tiles are thicker than the PowerPlay Rubber Tiles. Very easy to install and looks great. We installed the flooring in a few hours directly over the existing wood flooring. Cuts easy just be sure to have a good blade in your utility knife and replace the blade if it starts to get dull. Now the gym has a nice safe workout surface and no more unsightly mats under all the gym equipment. We ordered this for a basement exercise room. It is very heavy duty and perfect for the room. A bit challenging to install but we are so pleased with our purchase. The tile thick and very heavy. It is also durable. Just as described. Just be weary of the weight of this product, it is somewhat difficult to move from the shipping drop off, to your desired location. But overall great product.